Nigel Short of England failed to repeat his last year's success in Gibraltar: Nikita Vitiugov of Russia became an insuperable obstacle for him. As we've already reported the group of four GMs fought in the play-off. Vitiugov beat Sandipan to face Short, he was stronger than Vachier-Lagrave, in the final. The final tie-break match consisted of two games 10+5 and turned out to be really dramatic. Short got a comfortable play in the first game as black, however, he started making mistakes and as a result lost a pawn. Vitiugov managed to convert his advantage in a complicated position with queens by the help of 5 seconds increment for about 60 moves. The Englishman made the decisive mistake when it started to seem that his heroic defence will let him to escape. In the 2nd tie-break game Russian GM has easily made draw as Black. Nikita vitiugov won the top prize of £ 20,000. The last and decisive round of Gibraltar Masters will start tomorrow four hours earlier than usual. Yesterday Maxime Vachier-Lagrave outplayed Gata Kamsky and joined the leaders Nigel Short and Nikita Vitiugov who agreed on a draw. The group of seven people, among them is Chinese Zhao Xue, is half a point behind the leaders. In yesterday's round she managed to beat Eduardo Iturrizaga as black. Round 10 of the Gibraltar Masters is almost over. The leaders finished their encounters in draws. 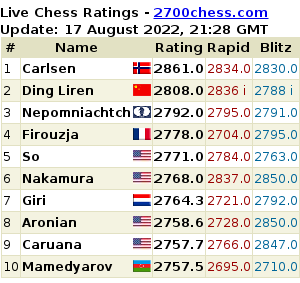 The top game Vitiugov - Vachier-Lagrave turned out to be quite unusual. The players started to improvise already in the opening. Salome Melia who has recently given a birth to her first child continues surprising in Gibraltar Masters. Recently we reported that Georgian player has outplayed GM Emil Sutovsky and agreed to a draw having a considerable advantage. 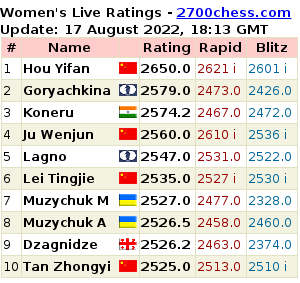 Today, Melia crushed Sutovsky's ward, one of the best women players of today, Anna Muzychuk.